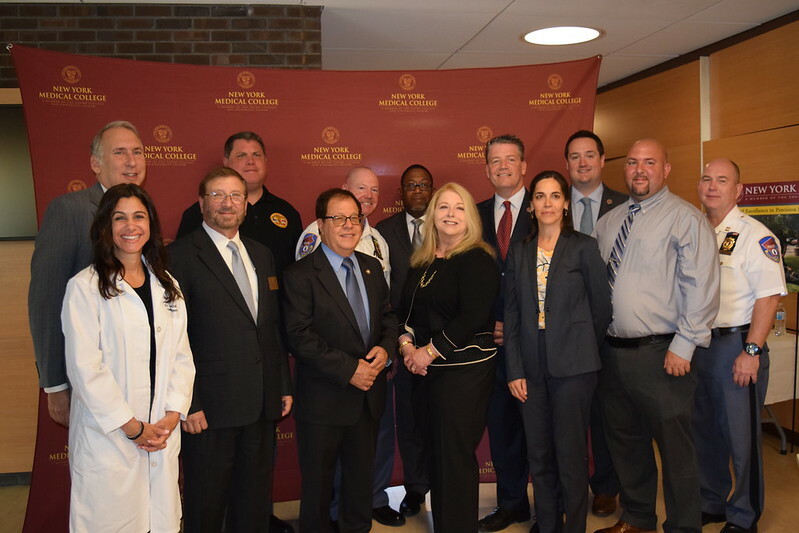 Administration, faculty, staff and elected officials gather at the Center of Excellence in Precision Responses to Bioterrorism and Disasters on the occasion of the awarding of $750,000 in funding from New York State. The Center of Excellence, which was the first of its kind in New York, provides training and expertise to improve responses to disasters and acts of terrorism. Valhalla, N.Y., July 10, 2018 – The New York Medical College (NYMC) Center of Excellence in Precision Responses to Bioterrorism and Disasters will receive $750,000 from New York State, a major increase in funding for a vitally needed program. New York State increased its financial support for the Center from an initial annual pledge of $500,000 to $750,000, a sum that is matched by NYMC in support of the expanding work and impact of the Center. The Center of Excellence combines NYMC’s globally recognized expertise in disaster medicine and medical countermeasures and works with partners in New York State to increase the capacity of the first responders, hospitals, and health care systems to respond to disasters, acts of terrorism and public health emergencies. The 2017 creation of the Center of Excellence in Precision Responses to Bioterrorism and Disasters, which was the first of its kind in New York, provides training and expertise to improve responses to disasters and acts of terrorism. This increased financial support will allow NYMC to expand the training programs for hospitals, health systems, and first responders throughout New York State. The school has committed funding for the renovation of a new state-of-the-art dedicated training facility on its Valhalla campus that will provide additional space for classroom learning, disaster simulation and real-world, scenario-based training to first responders. This capital renovation expands the Center’s existing training facility that includes a unique stimulation facility for the most severe and dynamic environments. This "austere medicine" training facility conducts sensory-immersion training to first responders—particularly SWAT teams and their medical components—a resource unmatched anywhere in the United States outside of the military and specialized federal government facilities. The Center of Excellence in Precision Responses to Bioterrorism and Disasters at New York Medical College received its designation in 2017 as a Center of Excellence by the New York State Division of Science, Technology and Innovation (NYSTAR) Program. This program, administered by Empire State Development, is designed to provide innovative and technologically advanced training and education to the workforce in New York State. New York State has established and currently supports 11 Centers of Excellence throughout the State. Three such centers exist in Rochester, two each in Buffalo and Long Island, and one in Syracuse, Albany and Binghamton. Prior to the opening of this Center in Valhalla, the Hudson Valley had no such designation. For more information on this and other training programs offered by the Center of Excellence in Precision Responses to Bioterrorism and Disasters at NYMC, please contact the Center Director, Dr. Michael Reilly at 914-594-1750 or disaster_medicine@nymc.edu. Back from left: Edward C. Halperin, M.D., M.A., Chancellor and CEO, New York Medical College; Michael Hagan, President, Westchester Police Benevolent Association; John Hodges, Chief Inspector, Westchester County Police; Alonzo West, President, Westchester County Correction Officers' Benevolent Association; New York State Senator Terrence Murphy; and Michael J. Reilly, Dr.P.H., M.P.H., Director, Center of Disaster Medicine, New York Medical College. Front from left: Laura Iavicoli, M.D., Associate Director of the Emergency Department EMS/ Emergency Management Director of the Emergency Department NYCHH Elmhurst; Robert W. Amler, M.D., M.B.A., Vice President for Government Affairs, New York Medical College; New York State Assemblyman Tom Abinanti; Sherlita Amler, M.D., M.S., Westchester County Commissioner of Health; Jenna Mandel-Ricci, Vice President, Regulatory and Professional Affairs, Greater New York Hospital Association; Peter DiChiara, Westchester County Superior Correction Officers; Captain Mark Busche, Westchester County Police.